﻿ Irish Film Institute -Win a prize bundle for the Great Beauty! Win a prize bundle for the Great Beauty! Paolo Sorrentino returns refreshed to Rome and cements his place amongst leading European filmmakers with his latest work, The Great Beauty. Sorrentino’s regular leading actor Toni Servillo is excellent as always playing journalist Jep Gambardella, who came to fame decades before as author of a novel which he has yet to follow up. Apparently content to rule Rome’s social scene, Jep’s birthday brings a new reflectiveness, magnified by an encounter with the widower of his first love which inspires him to perhaps finally fulfil the promise of his youth. Beautifully made, and filled with cinematic references, it’s one of the year’s finest. 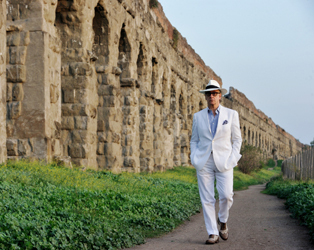 The Great Beauty runs at the IFI from September 6th. BOOK NOW! To celebrate the highly anticipated release of Sorrentino’s lavish and decadent latest work, we have a fantastic prize bundle to give away including: a pair of tickets to any screening of The Great Beauty at the IFI, the official poster for the film, a DVD copy of Paolo Sorrentino’s The Consequences of Love, along with its official poster also. To be in with a chance of winning this excellent prize bundle, just answer the question below before midday on Monday, September 9th 2013, and the winner will be announced shortly after. Which one of the following films did Paolo Sorrentino NOT direct?